Chewings Fescue is an all-around performer. 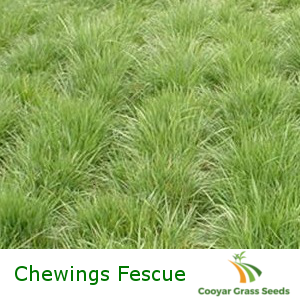 Of the Fescue family, Chewings Fescue is the fastest to establish, with conditions permitting, germination can be expected between two – three weeks. It also has strong drought and shade tolerance, as well as moderate tolerances to frost and wet soil which means it can grow Australia wide. For this reason the grass is most commonly found as a companion grass, to assist other grasses that might not do so well in the conditions, however there is nothing preventing its use as an independent grass. Package Contents: 100% Chewings Fescue. Establishment: Conditions permitting, 14 – 21 days. Sowing Rate: 2kg – 3kg per 100 sq meters.